This has to be one of my most favorite movies from my childhood (and one of the best Christmasey movies EVER). Yes I do realise it is April . . . but it is Easter Sunday . . . and it is on TV and I am sitting watching it. Macaulay Culkin, was such a cute little kid and such a good actor. Just a shame lots of things happened in his personal life and affected what could have been a fantastic career. Anyway, Home Alone is really fantastic and probably every kids fantasty of being left alone at home to do pretty much what ever you want. Eating junk food and watching movies/TV that you know you wouldnt normally be allowed to do. But what happens when burglers target your home? You protect it, with toy cars, a pet spider and pretty much anything else you can get your hands on! Fantastic! You get scared of the creepy guy next door . . . who turns out to be really cool and helps out in the end. Also back in the day of the Sega Mega Drive, we used to play on the home alone game where you had to stop the burglers flooding the houses. If I remember rightly it was actually a rather difficult game to play. Out of all my friends we all love home alone as we grew up watching it. Hopefully younger generations will also grow up watching it. Not the crappy Home Alone 3 though as that is just not the same at all. I love when he goes shopping its just too cute. The sledge down the stairs is always something I wanted to do after watching the movie, yes that is very sad but would have been soooooooooo cool. This movie is basically fantastic family entertainment, and so much fun. It really is just so awesome, I could never get bored of watching it. No matter what time of year it is. 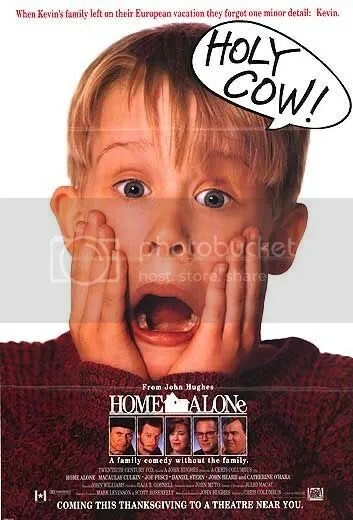 Ya, I have seen Home alone just now, I like the direction.